Ardit Ferizi was sentenced to 20 years in a federal prison for giving the names, phone numbers, and addresses of over 1,000 U.S. soldiers to ISIS. The Kosovo born hacker was arrested in Malaysia last year. A federal court in Alexandria, Virginia handed down his sentence on Friday. 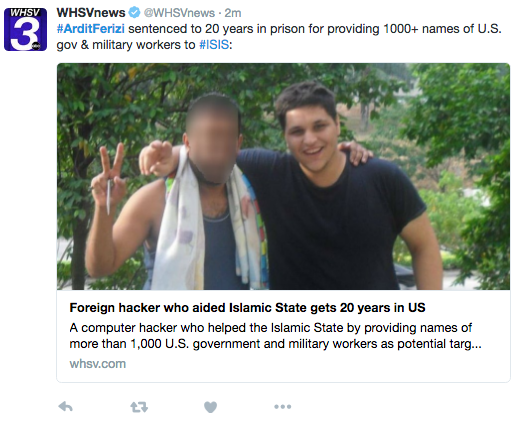 Ferizi is the first person in the United States to be convicted of both computer hacking and terrorism charges. 20-year-old Ferizi obtained the information by hacking a private company’s servers and extracting the information of any individual using a .gov and .mil email address. Several weeks later ISIS released a kill list threatening the soldiers and calling for ISIS supporters to launch isolated attacks. ABC7 News reporter Stephen Tschida was present for one of Ferizi’s court dates in January. He stated that Ferizi seemed “jovial” when communicating with his translator and showed no remorse for what he did. Prosecutors sought the maximum sentence of 25 years. Lawyers representing Ferizi sought a 6 year sentence claiming that Ferizi “did no harm” despite the evidence of the kill list.